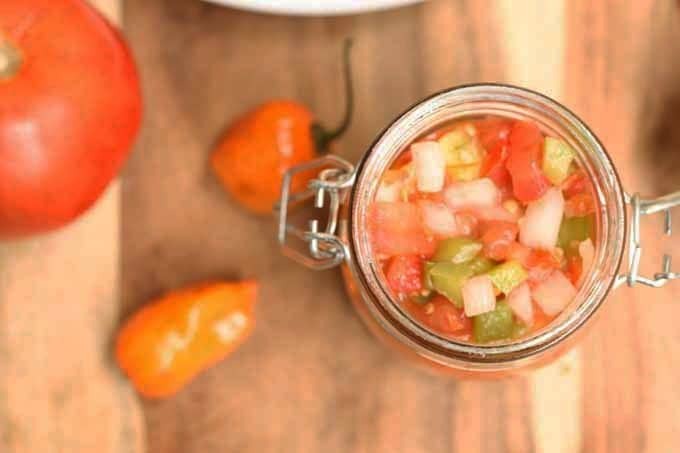 This tomato habanero relish is perfect for BBQ season! 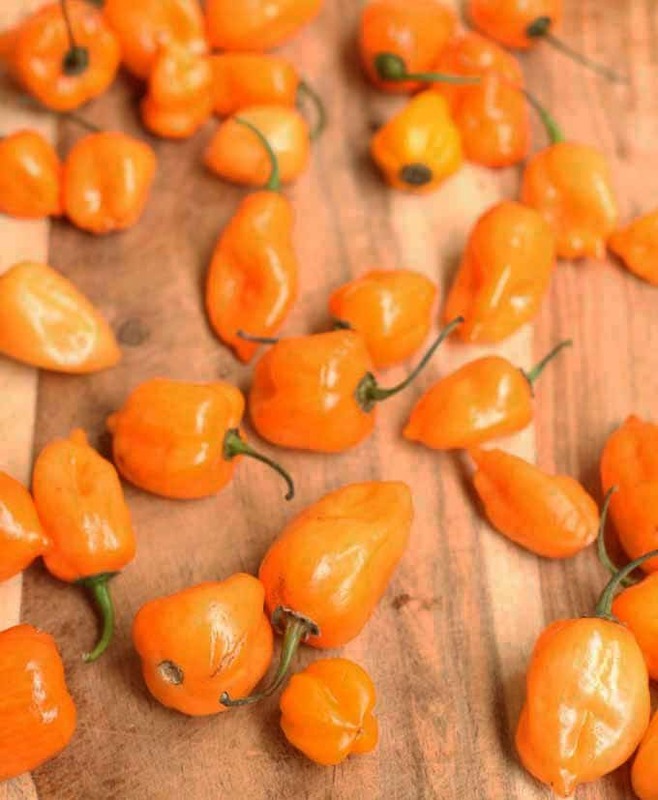 Garnish your hot dogs and sausages with it or top a grilled steak or chicken breast with it. It’s so flavorful you could even eat it with chips! I was away at Blogger Duck U with Maple Leaf Farms last week (recap coming soon!!) and before I left, I didn’t really get a chance to cook. In fact, in the summer I try not to turn the stove or oven on if possible so as not to overheat our home. Mr. B. had to do a whole lot of grilling while I was gone. I know I have said it before, but man, my man can eat. Mr. B picks up Polish and Italian sausages a lot, and the occasional hot dog. It is easy for him to grab a bag of buns and a container of sausages for work, especially if I’m not around to help him pack up his lunch. We are always picking up different garnishes to help make his quick lunches feel a little less quick and more like I’m making lunch. We have 6 or 7 different types of mustard, multiple jars and bottles of BBQ sauce, and ketchup galore. Our little fridge becomes like Mary Poppins’ magic bag when it comes to condiments. Pickles? We have 4 different kinds. And don’t even get me started on olives. Being from Chicago, I am a HUGE fan of Chicago style hot dogs and will even eat sausages that way. 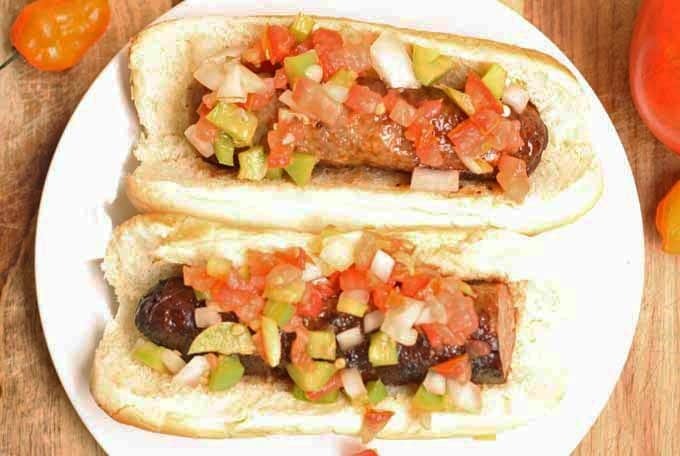 In case you aren’t familiar with a Chicago style hot dog, they are topped with yellow mustard, white onions, a dill pickle spear, tomato wedges, sport peppers, celery salt. And bright green sweet pickle relish. Bright green sweet pickle relish is reminiscent of Ghostbusters’ ectoplasm. And although it is tasty, it weirds me out a little bit (that green color is unnatural). 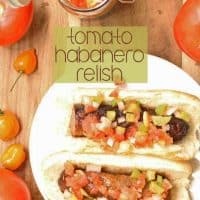 I concocted this relish as its replacement for my home grilling – it is so full of fresh ingredients and flavor that I want to put it on everything. Literally everything. As I was eating a bratwurst loaded with it, pieces of relish were falling and I was using my fingers to scoop it up and eat it. I know that might seem gross but I couldn’t help myself; it was so damn good. Add the tomatoes, green pepper, onion, habenero, salt, pepper and sugar to the pan. Cook for 4-5 minutes, or until the vegetables are slightly softened. Add the vinegar and mustard. Mix well. 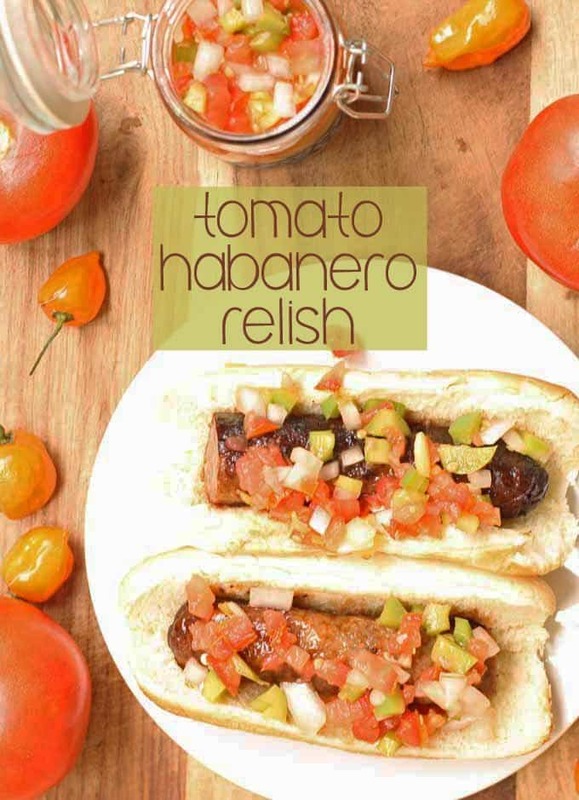 I hope you enjoy this relish and add it to your list of hot dog/sausage toppers. 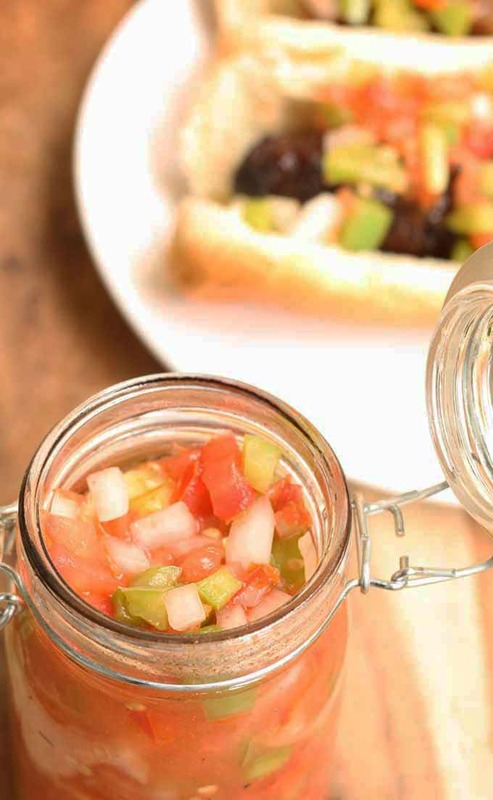 Jar up what you don’t use and keep a jar in the fridge for your next neighborhood barbecue. Thanks for the recipe, Jenny! Wish I had some of your “extra” habaneros and I would start on that relish right away! Awww, Marleen, I wish I could send some to you. I don’t think I’m allowed to ship fruits/vegetables oversees, but I’m not sure about when they’re dried. I will do some research.